Like all affidavits, the sample affidavit below allows the signer to swear that something is true or factual. Signers—sometimes called “deponents” or “affiants”—can certify the eligibility of a content entry, verify the facts surrounding someone’s birth, or even notify a court that an original document has been lost. Think of it as a sworn, written oath, like one you might take in court; you’re swearing that certain information is true. In this sample affidavit, John Doe swears that he has lived at his address for five years, but you can use an affidavit to attest to many different facts. Sample Affidavit. To create your own personalized affidavit, click on the image above. 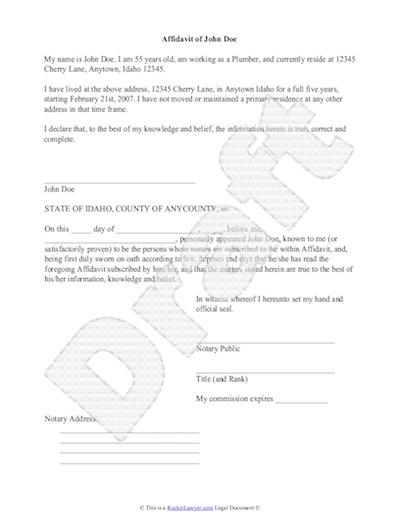 Most affidavits look similar to this sample affidavit in format and most require the same steps to make them fully legal. You’ll sign the document in front of a notary public, who will then sign his or her name, attesting that you knew what you were signing and that he or she witnessed the signature. You can also browse our most popular personal legal forms for specific affidavits, such as an Affidavit of Financial Support or Affidavit of Name Change.